In March of 2009, Model D published an article entitled "Detroit House: $100. Bold New Ideas for the City: Priceless" that highlighted the early efforts of Powerhouse Productions in a Detroit neighborhood just north of Carpenter Street, one of the city's borders with Hamtramck. At the end of the article, Power House's Mitch Cope was quoted saying, "This is just the beginning. There's more to come." He was right. Spend time walking through Banglatown, where corner markets, urban farms, schools, churches, mosques, and houses -- especially houses, most of them modest wood frames with a few "Hamtramck-style" vertical duplexes squeezed in -- give its narrow streets a gritty but cozy lived-in look. Walking is ideal. Cycling works, but you might miss the sidewalk and porch interactions, which often dazzle with their welcoming and warmth. Banglatown extends from Carpenter -- its nearly imperceptible, often misidentified border with Hamtramck -- to the Davison Freeway. Two main commercial avenues border Banglatown on its western (Jos. Campau) and eastern (Conant) edges. 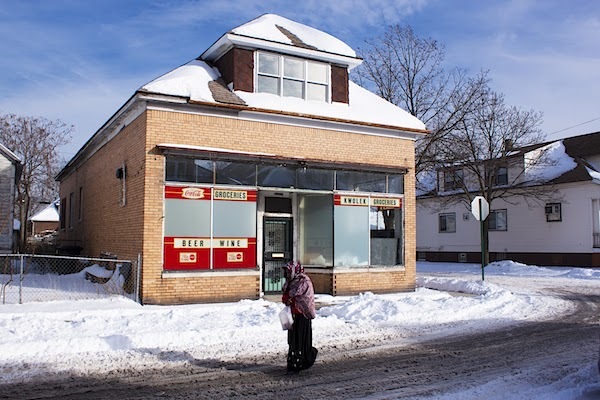 BanglatownA sweeping, largely organic revitalization of Conant began with Bangladeshi businesses (some of them, like Amar Pizza, have received national media attention). 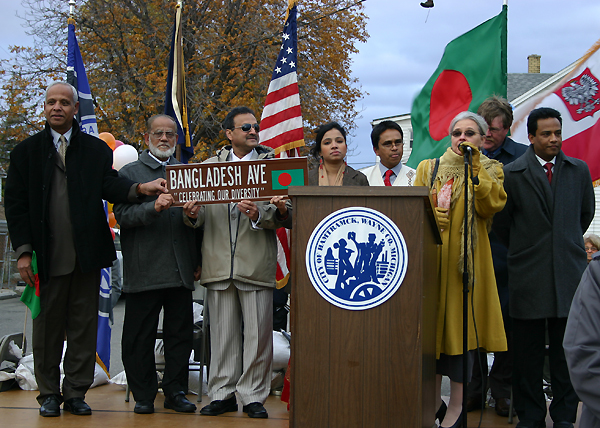 In 2008, a roughly one-mile stretch Conant from Davison south to Caniff in Hamtramck was given an honorary designation as Bangladesh Avenue. The strip is lively day and night, filled with green grocers, halal butchers, restaurants, and clothing shops. The air on its side streets fill daily with the aromas of curries and other spices. In September 2008, two months before the Bangladeshi Avenue dedication, artist Mitch Cope and architect Gina Reichert (who had been running a little company called Design 99) produced a piece for the Metro Times that described a plan of action for their Detroit neighborhood, which some had been calling NoHam since the 1990s. It was, in effect, a creative placemaking manifesto acknowledging "the multicultural aspect of our neighborhood" and promising that "the opening-up of the design and construction process would be seen as public performances." They also said that boarded-up houses waiting for windows to be installed "would become a temporary sculptural element doubling as a security feature. Or if a vacant lot or house simply needed to make itself known as not vacant, thousands of solar garden lights could be installed all over the lots, creating a solar star field, or all over the house, creating a star house." They were describing the Power House, which they purchased at Wayne County auction for $500, then rehabbed and took off the conventional energy grid. The story, coming in the midst of the recession of 2007-2009, became a cause célèbre. It traveled far on the backs of local, national, and international media. Nearly six years after it launched, a walk through the neighborhood reveals houses being upgraded and landscaping and gardens returning. Families are living there. Children are riding bikes and playing on the sidewalks and in the yards. At the same time, Power House Productions, now a nonprofit that has purchased several more properties, has stayed true to its community mission by integrating its redevelopment strategy into a living, breathing neighborhood made up of real people. Its constellation of properties includes the Yellow House, the Jar House, the Squash House, the Sound House, the Play House and the Power House itself. Also part of the nonprofit: the planned Skate House and the still-in-progress Ride it Sculpture Park on the northern end of the community. Gina ReichertTalking with Reichert inside the Yellow House, which is where she and Cope now conduct the nonprofit's business, she says that one of the primary goals of the project is becoming visible all around them. "We wanted to get the neighborhood ready for living, and we can see it happening now," Reichert says. "We had so many calls, so much attention at first that we said 'yes' to every interview. I think some people expected it to take off immediately, but we saw it as a long-term community plan, not a fancy art project." Up and down the Klinger and Moran residential corridor, you have to look closely to see the project developing. Except for few visually stunning outliers (houses on Moran Street colorfully transformed by artists selected by California-based Juxtapoz magazine in 2010), the changes are subtle. It looks like a place where artists and immigrants from South Asia just happen to live together. Several non-Power House-related developments have sprung up in the neighborhood, including the Write a House project, launched by Toby Barlow and Sara5h Cox in 2013; Burnside Farm; the greenhouse project know as the Afterhouse; the studio of the Right Brothers, video and film producers who have worked with hip hop artists Passalacqua and others; the Zimbabwe Cultural Centre of Detroit; and architect Charlie O'Geen's Floating House. 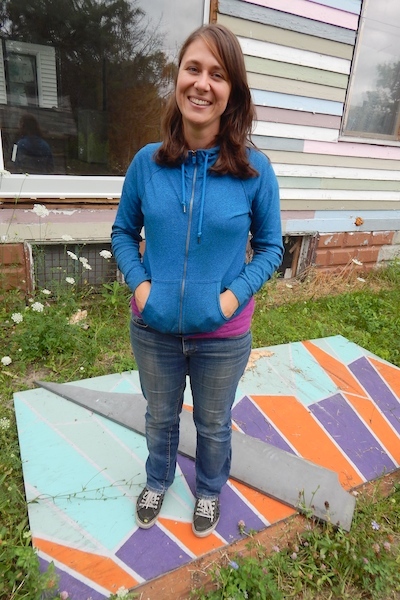 This summer came word of the Carpenter Exchange, a collaborative effort linking artists and community builders on both sides of the the Detroit/Hamtramck border. The project received a $100K Our Town Grant from the National Endowment for the Arts (NEA) for a series of creative placemaking events over an 18-month period. Other partners in the grant are the Hinterlands, Carrie Morris Arts Production, Popps Packing, the Work Department, and the City of Hamtramck. The Carpenter Exchange includes the two-day Porous Borders Festival, an event planned for May 2015 that will extend along the entirety of Hamtramck's border with Detroit (not just Carpenter) and feature open-air performances, art installations, and food vendors. The Hinterlands, a performance art group based in Banglatown, is organizing the festival. Hinterlands co-founders and co-directors Liza Bielby and Richard Newman primarily use the Play House for performances, a space they share with the Bangla School of Music. 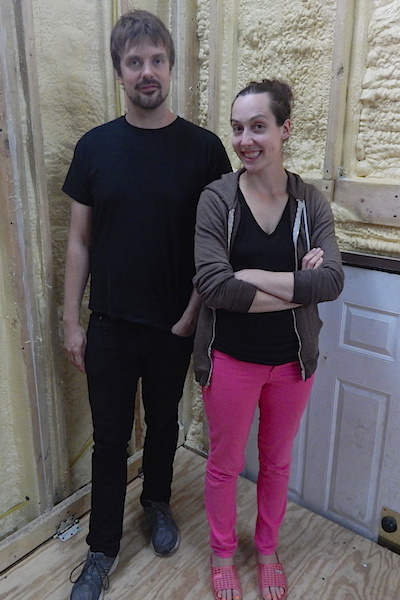 Richard Newman and Liza Bielby of the Hinterlands"We are looking for partnerships on either side of (Carpenter)," says Bielby, talking inside the Play House on a recent rainy afternoon. "The idea of the porous borders came as a way to engage stories of people along geographical and cultural borders, reaching outside of our networks." Some of the proposed activities for next year's festival include a cricket match and a battle of the battle of the bands between musicians and sound artists from Banglatown and Hamtramck. To prepare, Bielby and Newman walked the entirety of Hamtramck's border with Detroit. Much of the staging of the festival will take place on Carpenter, but actions are being planned for other sections of the porous border. Neighborhood redevelopment combined with artistic vision has also been happening along the western end of Carpenter. This community calls itself the Northwest Territories and includes grant partners Popps Packing and Carrie Morris Art Production (CMAP), as well as new experimental performance and exhibition space called Keinhaus. Morris started CMAP in 2012 as a way to explore contemporary puppetry and multimedia works. The nonprofit is on the Detroit side of Carpenter near the intersection of Lumpkin. In 2015, CMAP will be staging the Outdoor Summer Concert Series, which will feature four large-scale puppet and music collaborative events scheduled monthly from June through September. CMAP will also be the site of the Teen Girl Video Project, a series of workshops for girls ages 13-18 focusing on digital media training and communications skills. Just to west, Popps Packing, located on the Hamtramck side of Carpenter, is converting a building on the Detroit side into a general store called Popps Emporium. Faina Lerman, Popps PackingFaina Lerman says the general store is expected to be ready by next spring and will be an extension of the mission that she and Graem Whyte have for Popps. "It's part of an inclusive approach to building communication and community with our neighbors," she says. 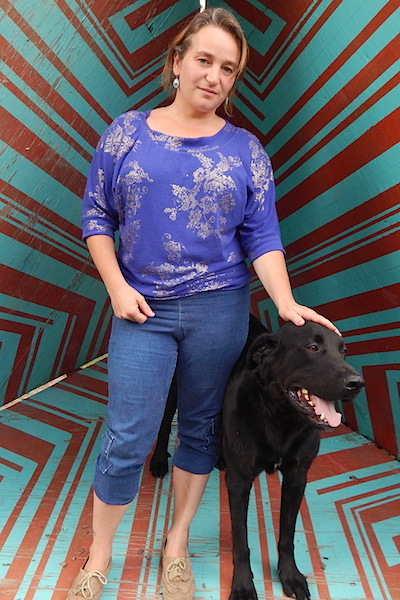 "You have to go beyond the circle of people that come to art events we have. We want (the emporium) to be a place where people can come to share services or tools that everybody can use to improve neighborhood life." 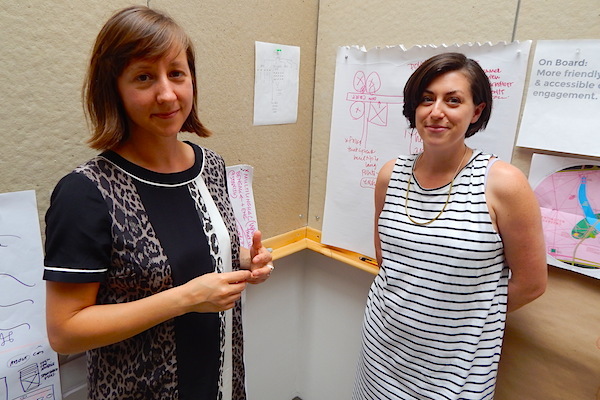 The Work Department, a small communication design and development studio in Hamtramck, is also contributing tools to the exchange project. But the tools they're offering are digital. The Work Department's co-founder Nina Bianchi says they are creating a toolkit called "Let's Talk about It" for the exchange project. "We plan on it being ready by late fall," Bianchi says. "We'll also be doing public workshops and graphic installations." The Work DepartmentAmong other things, the Work Department has done web design and marketing for the City of Hamtramck and for Power House Productions. The firm also plans on creating a map that helps create a more clear identity for Banglatown and the Carpenter corridor. These are exciting times for an evolving neighborhood, its borders, and the people that live on the Detroit and the Hamtramck side of Carpenter. The best news is that it appears there is much more work to be done, to be continued in the months and years to come. Walter Wasacz is a Hamtramck-based freelance writer and editor and a former managing editor for Model D. Follow him on Twitter @nospectacle. All photos by Walter Wasacz except Banglatown winter scene by Matthew Lewis.